Purpose: The purpose of this study was to evaluate the safety profile of intravitreal bevacizumab (Avastin) as an off-label pharmacotherapeutic agent for various ocular conditions. Methods: Retrospective analysis was carried out on 3806 injections of 1761 patients that were administered with intravitreal bevacizumab injection at a tertiary eye care center in India. The injections were administered on a pro re nata basis for various indications such as age-related macular degeneration (AMD), diabetic macular edema (DME), and retinal vein occlusion (RVO). Results: The mean age of the patients was 61.8 ± 11.59 years. A total of 59.2% of the patients were men and 40.8% women. The most common indications for which the injection was administered were DME (27.5%), AMD (26%), and branch RVO (12.3%). Among the ocular side effects, endophthalmitis was seen in three eyes (0.08%), retinal breaks in none of the eyes whereas 35 eyes had a rise in intraocular pressure (IOP) >21 mmHg (0.9%). Preexisting glaucoma was present in four eyes while remaining 31 eyes did not have any history of glaucoma. IOP rise was significantly more in eyes with preexisting glaucoma as compared to nonglaucomatous eyes (P = 0.04). No systemic adverse events were noted in our study population. Conclusion: Our study provides real-world evidence regarding the safety profile of intravitreal bevacizumab (Avastin). These data suggest that bevacizumab is a safe and economical pharmacotherapeutic agent that can be administered for a variety of ocular disorders. Analyzing the safety of bevacizumab is necessary for a developing country like India as the majority of the population cannot afford the costly ranibizumab as compared to bevacizumab for ocular healthcare. Typically, the patients with retinal diseases such as AMD and DME require multiple doses of anti-VEGF agents. As the burden of injections is high in many of these retinal pathologies, few pertinent questions still remain regarding the treatment such as (1) the choice of agent, and (2) the economic burden of therapy. Ranibizumab and aflibercept have been approved by the US Food and Drug Administration (FDA) for the management of these retinal diseases. Alternatively, bevacizumab which was designed to inhibit tumor angiogenesis received US-FDA approval for its use in colorectal carcinomas. Subsequently, it gained widespread access as an off-label medication for the treatment of various neovascular disorders.,,,, However, as bevacizumab is a chemotherapeutic agent, it is currently available in a 4-mL vial from which multiple doses are used as aliquots for ophthalmic use. Over the past 5 years, multiple trials that compared ranibizumab with bevacizumab in multiple treatment regimens such as monthly dosing, pro re nata dosing and treat-and-extend dosing were conducted. The results of all these trials, including the IVAN  study, CATT trial, MANTA  trial, LUCAS  trial, and GEFAL  trial, have shown that bevacizumab is noninferior to ranibizumab with a similar safety profile. In the American Society of Retina Specialists (ASRS) Preferences and Trends Survey conducted in 2015, which was on the basis of the current body of literature and considering the cost-effectiveness of bevacizumab, 64% of the US retinal physicians used bevacizumab as the first-line treatment for AMD and >80% of the US members treated choroidal neovascularization from histoplasmosis and other non-AMD causes with bevacizumab. The available evidence from the landmark trials along with the preferred practice patterns of retinal physicians evidently support the widespread use of bevacizumab throughout the world. Moreover, the cost of approved agents, including ranibizumab and aflibercept, is significantly higher than bevacizumab. In 2014, the Italian Competition Authority imposed a fine of €180 million on Novartis and Roche for allegedly striking an alliance to prevent the use of bevacizumab (Roche) in support of the more expensive medication, ranibizumab. One major challenging issue in utilizing bevacizumab for retinal pathologies is its non-FDA approval. Although it is being used extensively as an ocular therapeutic, it definitely has got medico-legal implications. Since it is available in the form of 4-mL vial, multiple doses need to be aliquoted for ophthalmic use. This method has an inherent risk of infection, especially if multiple pricks are performed for aliquoting it. In addition, maintaining cold chain and storage of the vial may affect the viability of the drug. In the USA, there have been incidences of bevacizumab-related endophthalmitis, which has prompted the US-FDA to issue an alert regarding its ocular use. After this incidence, the manufacturing company, Genetech, issued a statement “Avastin is not manufactured or approved and to date has not been proven safe for use in the eye,” regarding the off-label use of bevacizumab in the eye. Recently, there was a ban on the ocular use of intravitreal bevacizumab in India after a cluster of incidence of endophthalmitis that emerged from few centers. After much deliberation, the Drug Controller General of India (DGCI) revoked the ban, which paved the way for widespread use of bevacizumab. However, there is a dearth of real-life data regarding the safety profile of bevacizumab in India. To fill this lacuna that is currently based only on the information provided from clinical trials, we aimed to conduct an analysis of suspected adverse drug events associated with the intravitreal bevacizumab. It is a retrospective analysis of all eyes that underwent intravitreal bevacizumab therapy from January 2013 to December 2015 at tertiary eye center in India. The electronic medical records (EMRs) of the patients who were administered all intravitreal injections and those who were administered intravitreal bevacizumab were evaluated thoroughly and included in the study. The indications for the intravitreal injections included vitreoretinal pathologies such as AMD, DME, RVO, and nonresolving vitreous hemorrhage (VH). Patients with <1 month of follow-up were excluded from the study. A computerized database was created for all the records, and any ocular or systemic adverse events were noted. All patients who took intravitreal bevacizumab in the study group and having at least 1 month follow-up were included in the study as the effect of intravitreal bevacizumab is maximum for 1 month. A total of 3806 injections were given in 1761 patients during the study. The patient underwent routine ophthalmic examination including best corrected visual acuity, intraocular pressure (IOP) evaluation by Goldmann applanation tonometry, slit-lamp biomicroscopy, indirect ophthalmoscopy, and spectral domain optical coherence tomography (SD-OCT) (Spectralis HRA + OCT, Heidelberg Engineering, Heidelberg, Germany). For confirmation of diagnoses such as Wet AMD and polypoidal choroidal vasculopathy (PCV) patient underwent digital fluorescein angiography (DFA) and indocyanine green angiography. Patients were evaluated at baseline and postinjection at day 7 and 4 weeks. SD-OCT was repeated at 4 weeks after each injection. ICG and DFA were repeated according to the condition of the disease and at the discretion of treating physician. The safety outcomes parameter such as endophthalmitis, IOP rise, retinal break, and cataract was included in the study. To the best of our knowledge, there are no clinical reports to investigate the issue of the time course of IOP changes, cataract formation after bevacizumab injection. It is clinically important to understand the effects of bevacizumab short term as well as long term. Although there is a trend toward an overall favorable systemic safety profile, current data are insufficient to definitively conclude that intravitreal anti-VEGF agents are safe especially bevacizumab. So that's why we have also looked into the systemic events in this study group like cardiovascular or cerebrovascular events. Since our study was a retrospective analysis of patient data from the electronic records, consent was not obtained. The study was conducted in accordance to the tenets of the Declaration of Helsinki and was approved by the Institutional Review Board. The statistical analysis was performed using the SPSS software 16.0 (IBM, Chicago, Illinois, USA). Fisher's exact test was used in the study to compare the IOP rise among the patients who had preexisting glaucoma and who did not. Statistical significance was assumed at P < 0.05. The mean age of the study population was 61.8 ± 11.59 years (range: 10–96 years) of which 59% were men and 41% were women. 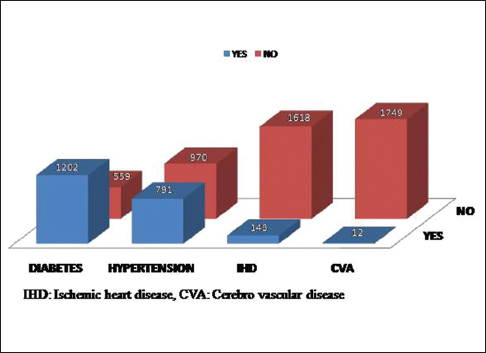 Of the 1761 patients, 1202 had preexisting diabetes (68.3%), 791 were hypertensive (44.9%), 143 had a history of ischemic heart disease (8.1%), and 12 patients had a history of prior cerebrovascular accident (0.7%) shown in [Figure 1]. 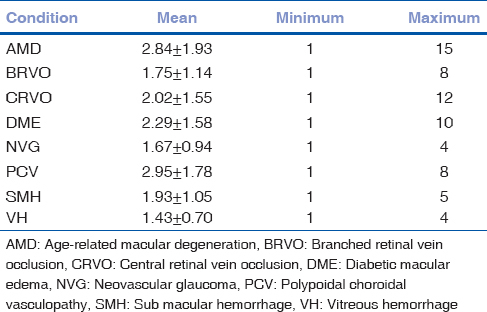 The most common indications for the injection were DME (27.5%) followed by AMD (26%), branch RVO (BRVO) (12.3%), central RVO (CRVO) (10.7%), and VH (10.2%) shown in [Figure 2] and [Table 1]. The mean number of injections were 2.16 ± 1.56, ranging from 1 to a maximum of 15 injections. 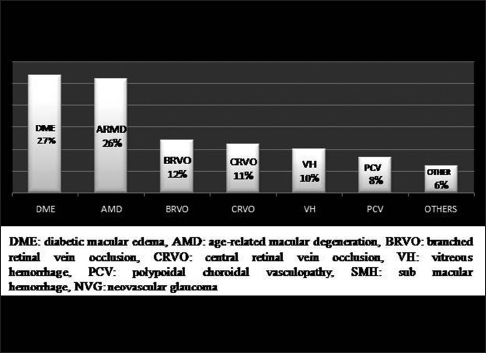 The maximum numbers of injections were given in PCV (2.95 ± 1.78) followed by AMD (2.84 ± 1.93) and DME (2.29 ± 1.58) as shown in [Table 2]. Out of 1761 patients, preexisting glaucoma was present in 68 patients (4.0%) whereas 1693 (96%) did not have any history of prior glaucoma. Of the 1761 patients, 1589 (90.2%) were phakic, 170 (9.7%) were pseudophakic, and 2 (0.1%) were aphakic. There were no systemic adverse events noted in our study population. On every visit, the patient's systemic conditions were noted in EMR. Ocular adverse drug reactions (ADRs) noted in the study group that were given injections included three patients who developed endophthalmitis (0.08%), and 35 patients who had IOP rise of >21 mm of Hg (0.9%) as shown in [Table 3]. IOP rise was more significantly seen in the patients with preexisting glaucoma (4/68 eyes) as compared with the patients without any history of glaucoma in the past (31/1693 eyes) (P = 0.04) shown in [Table 4]. No reports of retinal breaks and cataract development were noted because of the injections. 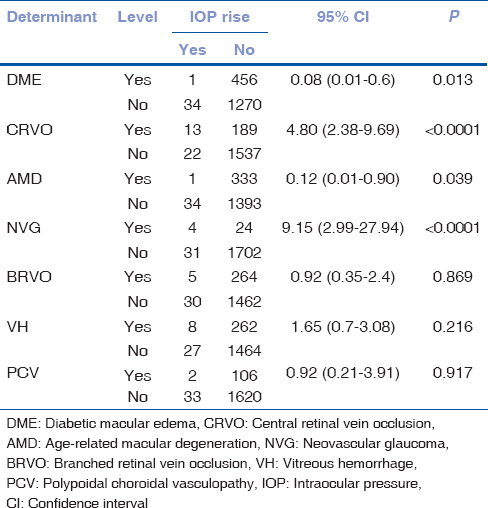 When we analyzed the correlation of IOP rise with the various disease entities, we found neovascular glaucoma (NVG) and CRVO to be significantly associated with the raised IOP postinjection (P < 0.0001). Also, subjects who have NVG were 9.15 times at a higher risk of developing a rise in IOP compared with the non-NVG patients [Table 5]. We did not find any significant correlation between the number of the injections and occurrence of adverse events such as IOP rise and endophthalmitis [Table 6] and [Table 7]. In recent times, with the advent and increasing use of anti-VEGF agents for the intraocular use, there has been a paradigm shift in the management of various medical retinal pathologies including neovascular AMD, diabetic retinopathy, DME, and RVO. Numerous trials conducted worldwide (CATT trial, IVAN trial, GEFAL, MANTA),,,, on thousands of patients have shown intravitreal bevacizumab (Avastin) to be noninferior to ranibizumab (Lucentis) in terms of efficacy and safety. Bevacizumab also has the advantage of reducing the cost of therapy, especially in developing countries where the population's access to resources is limited, and it helps to reduce the financial burden of multiple injections. In recent times, sporadic episodes of endophthalmitis postintravitreal bevacizumab have created a big debate about the safety of bevacizumab as an off-label medication used in ocular pathologies. Recently, in January 2016, after few cluster episodes of postbevacizumab endophthalmitis emerged in India, the DGCI banned its intraocular use. It was a major setback for the patients from lower socioeconomic strata as they could not afford monthly injections of the more expensive agent such as Lucentis. After various debates, deliberations, and reviews of the compiled reports of the off-label use of bevacizumab worldwide, the Government of India revoked the ban on bevacizumab. Guidelines, meant to be followed religiously at all centers, were formulated by the Vitreo Retinal Society of India for the safe administration of bevacizumab. Subsequently, we carried out a thorough PubMed/MEDLINE search, and it revealed a lack of substantial data on the safety profile of intraocular use of bevacizumab on the Indian population. As one of the major tertiary eye care center in India, we decided to conduct a retrospective analysis on the safety profile of intravitreal bevacizumab procedures performed over the past 3 years at our center, amounting to 3806 injections. The relative ocular and systemic safety of bevacizumab is still debated. The CATT  trial showed comparable safety profiles between bevacizumab and ranibizumab at 2 years. On the contrary, 1 year data from the IVAN  study suggested an increased risk of stroke with ranibizumab, whereas no differences were found in the 2-year IVAN  report, as well as in GEFAL  and MANTA  efficacy trials. A retrospective cohort study published in 2010 and conducted on 146,942 Medicare beneficiaries did not show any difference in the risk of mortality, heart attack, stroke, or bleeding among the patients with AMD treated with bevacizumab or ranibizumab. Later, a systematic review of 278 articles by Van Der Reis et al. concluded that the rates of serious ocular and systemic ADRs after anti-VEGF injections used for any ophthalmic indication were low, without any differences in the incidences among the assessed drugs. As a matter of fact, systemic adverse events had lower incidence rates for intravitreal bevacizumab in comparison with ranibizumab. In contrast, the results of a systematic review  investigating the relative safety of bevacizumab and ranibizumab showed a significantly higher rate of ocular and systemic adverse effects with bevacizumab as compared with ranibizumab. It should be noted, however, that most of the patients came from the CATT trial, which was not statistically powerful enough to identify safety differences between the two compounds. In their case–control study, Campbell et al. showed that the intravitreal injections of VEGF inhibitors were not associated with significant risks of ischemic stroke, acute myocardial infarction, congestive heart failure, or venous thromboembolism. In this study, we did not note any systemic adverse event within 1 month of administering intravitreal bevacizumab injection. Many studies evaluating the safety profile of intravitreal injections are not powered to detect systemic events, and the current data are insufficient for investigating the incidence of systemic adverse events and associated risk factors. Among those studies evaluating systemic adverse events, many were small, uncontrolled, and retrospective. The incidence of overall systemic adverse events of intravitreal injections varied from 0% to 39.3%.,,,,,,, The current data from various studies suggest that intravitreal anti-VEGF agents are overall safe, although this is not conclusive. However, caution should be exerted in the patients with a history of recent cardiovascular disease or stroke as these patients may be at a greater risk for systemic serious adverse events. According to one report of ASRS, they administered 16,115 doses of anti-VEGF intravitreal injections, 90% of which were bevacizumab. They had only one instance of endophthalmitis after the administration of bevacizumab. 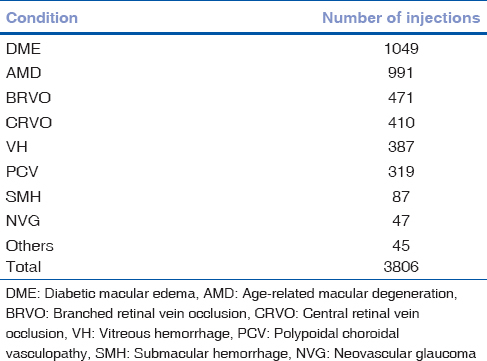 Vitreoretinal surgeons in Minnesota administered 46,431 injections in 2014, 56% of which were bevacizumab. They reported an infection rate of 0.01% for bevacizumab compared to 0.02% for Lucentis. At Bascon Palmer Institute in Miami, they administered 119,000 intravitreal injections, 56% of which were bevacizumab. They reported an infection rate of 0.01% for bevacizumab compared to 0.025% for Lucentis and 0.03% for Eylea. In our study, we observed endophthalmitis in only three patients (0.08%) which was comparable to the other studies conducted in the western world. The factors contributing towards such favorable safety profile would include aliquoting and storage of bevacizumab under optimal aseptic precautions, maintaining excellent perioperative sterility, and giving an intravitreal injection under strictly followed aseptic conditions. According to the protocol which has been followed at our institute, we do not use antibiotic before intravitreal injections. Despite not using preinjection antibiotic, the endophthalmitis rate is very low which suggests that it may not be mandatory to use preinjection antibiotics. Of the three patients with endophthalmitis, two responded to intravitreal antibiotics alone whereas one underwent vitrectomy. In this study, we administered 3806 intravitreal bevacizumab injections in 1761 patients. Of the 3806 injections, the majority was given for DME (27%) followed by AMD (26%) and BRVO (12%), which was different from the western world where AMD is the most common cause for intravitreal injections. The mean number of injections were 2.16 ± 1.56 during a follow-up period of 3 years, with a maximum number of injections in PCV (2.95 ± 1.78) followed by AMD (2.84 ± 1.93). The number of injections is fewer when we compare with the real-world data of patients once they exit from the clinical trials. In the HORIZON  trial, patients received a mean of four injections in 2 years after exiting the trial whereas, in the Pan-American study, the patients received a mean of 11 injections over a period of 5 years. Furthermore, in 3.5 years after being released from the CATT trial, the patients received a mean of 4–5 injections per year. However, all these trials were carried out in a developed world where the attrition rate may be lower because of a better patient education and widespread medical insurance coverage. In the real-world scenarios found in the developing nations such as India, the economic burden of monthly injections could be one of the major factors for low mean number of injections. We identified raised IOP (>21 mm of Hg) in 35 eyes (0.9%). When a detailed evaluation of the patients with raised IOP was done, we found that four of the patients had preexisting glaucoma. This increase in IOP was significantly more in patients with preexisting glaucoma (4/68) as compared with the patients who do not have any history of glaucoma (31/1693 eyes) (P = 0.04). On evaluating the correlation between IOP rise and various disease entities, NVG and CRVO are found to be more significantly associated with raised IOP with P < 0.0001. In addition, the patients with NVG were 9.15 times at a higher risk of developing a rise in IOP compared with the non-NVG patients. We did a subgroup analysis on the basis of the presence or absence of raised IOP and the occurrence of endophthalmitis and correlated it with the number of injections. We did not find any significant correlation of IOP rise (P = 0.29) or endophthalmitis (P = 0.68) with the number of injections. In our study, only three patients developed retinal breaks (0.0007%). When we closely analyzed the medical records, we found that all the three patients underwent vitrectomy procedure after the injection for proliferative diabetic retinopathy and subsequently developed retinal breaks. On reviewing the intraoperative noted onto the EMR system, it was found that the retina breaks were iatrogenic during the vitrectomy procedure, and hence not related to the intravitreal injection. Of the 1761 patients in our study, 100 patients subsequently underwent cataract surgery. During our retrospective analysis, we did not notice any incidence of lens touch during the intravitreal procedure. In addition, on a retrospective evaluation of EMR charts, we found that the 100 patients who underwent cataract surgery had preexisting cataract changes. To summarize, although intravitreal bevacizumab (Avastin) continues to be an off-label therapy used in the treatment of ocular disorders, it remains to be the preferred agent of retinal physicians worldwide. For chronic diseases such as DME and AMD, that require frequent dosing, bevacizumab provides an ideal economical choice of treatment, especially in the developing nations. However, aliquoting of bevacizumab and its potential ocular and systemic adverse reactions continue to remain the limiting factor for its extensive use. Our study, the first of its kind in India, provides real-world evidence regarding the safety profile of intravitreal bevacizumab (Avastin). These data suggest that bevacizumab is a safe and economical pharmacotherapeutic agent that is used for treating a variety of ocular disorders. Favorable outcomes can be achieved by maintaining optimal sterility during the aliquoting step, intravitreal injection procedure, and perioperative care. Yau JW, Rogers SL, Kawasaki R, Lamoureux EL, Kowalski JW, Bek T, et al. Global prevalence and major risk factors of diabetic retinopathy. Diabetes Care 2012;35:556-64. Heier JS, Brown DM, Chong V, Korobelnik JF, Kaiser PK, Nguyen QD, et al. Intravitreal aflibercept (VEGF trap-eye) in wet age-related macular degeneration. Ophthalmology 2012;119:2537-48. CATT Research Group, Martin DF, Maguire MG, Ying GS, Grunwald JE, Fine SL, et al. Ranibizumab and bevacizumab for neovascular age-related macular degeneration. N Engl J Med 2011;364:1897-908. Heier JS, Antoszyk AN, Pavan PR, Leff SR, Rosenfeld PJ, Ciulla TA, et al. Ranibizumab for treatment of neovascular age-related macular degeneration: A phase I/II multicenter, controlled, multidose study. Ophthalmology 2006;113:633.e1-4. Kaiser PK, Cruess AF, Bogaert P, Khunti K, Kelly SP. Balancing risk in ophthalmic prescribing: Assessing the safety of anti-VEGF therapies and the risks associated with unlicensed medicines. Graefes Arch Clin Exp Ophthalmol 2012;250:1563-71. Rosenfeld PJ, Moshfeghi AA, Puliafito CA. Optical coherence tomography findings after an intravitreal injection of bevacizumab (avastin) for neovascular age-related macular degeneration. Ophthalmic Surg Lasers Imaging 2005;36:331-5. Bashshur ZF, Schakal A, Hamam RN, El Haibi CP, Jaafar RF, Noureddin BN. Intravitreal bevacizumab vs. verteporfin photodynamic therapy for neovascular age-related macular degeneration. Arch Ophthalmol 2007;125:1357-61. Chen CY, Wong TY, Heriot WJ. Intravitreal bevacizumab (Avastin) for neovascular age-related macular degeneration: A short-term study. Am J Ophthalmol 2007;143:510-2. Lazic R, Gabric N. Verteporfin therapy and intravitreal bevacizumab combined and alone in choroidal neovascularization due to age-related macular degeneration. Ophthalmology 2007;114:1179-85. Wu L, Martínez-Castellanos MA, Quiroz-Mercado H, Arevalo JF, Berrocal MH, Farah ME, et al. Twelve-month safety of intravitreal injections of bevacizumab (Avastin): Results of the Pan-American Collaborative Retina Study Group (PACORES). Graefes Arch Clin Exp Ophthalmol 2008;246:81-7. Ehlers JP. The MANTA 1-year results: The anti-VEGF debate continues. Br J Ophthalmol 2013;97:248-50. Berg K, Pedersen TR, Sandvik L, Bragadóttir R. Comparison of ranibizumab and bevacizumab for neovascular age-related macular degeneration according to LUCAS treat-and-extend protocol. Ophthalmology 2015;122:146-52. Kodjikian L, Souied EH, Mimoun G, Mauget-Faÿsse M, Behar-Cohen F, Decullier E, et al. Ranibizumab versus bevacizumab for neovascular age-related macular degeneration: Results from the GEFAL noninferiority randomized trial. Ophthalmology 2013;120:2300-9. Italy Fines Novartis and Roche in Collusion Case. The New York Times; 2014. Available from: http://www.nytimes.com/2014/03/06/business/international/italy-fines-novartis-and-roche-in-collusion-case.html?_r=0. [Last accessed on 2015 Sep 22]. van der Reis MI, La Heij EC, De Jong-Hesse Y, Ringens PJ, Hendrikse F, Schouten JS. A systematic review of the adverse events of intravitreal anti-vascular endothelial growth factor injections. Retina 2011;31:1449-69. Schmucker C, Ehlken C, Agostini HT, Antes G, Ruecker G, Lelgemann M, et al. A safety review and meta-analyses of bevacizumab and ranibizumab: Off-label versus goldstandard. PLoS One 2012;7:e42701. Campbell RJ, Gill SS, Bronskill SE, Paterson JM, Whitehead M, Bell CM. Adverse events with intravitreal injection of vascular endothelial growth factor inhibitors: Nested case-control study. BMJ 2012;345:e4203. Rich RM, Rosenfeld PJ, Puliafito CA, Dubovy SR, Davis JL, Flynn HW Jr., et al. Short-term safety and efficacy of intravitreal bevacizumab (Avastin) for neovascular age-related macular degeneration. Retina 2006;26:495-511. Fung AE, Rosenfeld PJ, Reichel E. The International Intravitreal Bevacizumab Safety Survey: Using the internet to assess drug safety worldwide. Br J Ophthalmol 2006;90:1344-9. Aisenbrey S, Ziemssen F, Volker M, Gelisken F, Szurman P, Jaissle G, et al. Intravitreal bevacizumab (Avastin) foroccult choroidal neovascularization in age-related macular degeneration. Graefes Arch Clin Exp Ophthalmol 2007;245:941-8. Cleary CA, Jungkim S, Ravikumar K, Kelliher C, Acheson RW, Hickey-Dwyer M. Intravitreal bevacizumab in the treatment of neovascular age-related macular degeneration, 6- and 9-month results. Eye (Lond) 2008;22:82-6. Lazic R, Gabric N. Intravitreally administered bevacizumab (Avastin) in minimally classic and occult choroidal neovascularization secondary to age-related macular degeneration. Graefes Arch Cl in Exp Ophthalmol 2007;245:68-73. Weigert G, Michels S, Sacu A, Varga A, Prager F, Geitzenauer W, et al. Intravitreal bevacizumab (Avastin) therapy versus photodynamic therapy plus intravitreal triamcinolone for neo vascular age-related macular degeneration: 6-month results of a prospective, randomised, controlled clinical study. Br J Ophthalmol 2008;92:356-60. Kaiser PK; Registry of Visudyne AMD Therapy Writing Committee, Boyer DS, Garcia R, Hao Y, Hughes MS, Jabbour NM, et al. Verteporfin photodynamic therapy combined with intravitreal bevacizumab for neovascular age-related macular degeneration. Ophthalmology 2009;116:747-55, 755.e1. Tufail A, Patel PJ, Egan C, Hykin P, da Cruz L, Gregor Z, et al. Bevacizumab for neovascular age related macular degeneration (ABC Trial): Multicentre randomised double masked study. BMJ 2010;340:c2459. Singer MA, Awh CC, Sadda SV, Freeman WR, Antoszyk AN, Wong P, et al. HORIZON: An open-label extension trial of ranibizumab for choroidal neovascularization secondary to age-related macular degeneration. Ophthalmology 2012;119:1175-83.